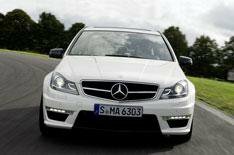 New Mercedes-Benz C63 AMG revealed | What Car? Mercedes has revealed photos of the C63 AMG, the performance version of the forthcoming C-Class. The car should go on sale this summer and is expected to be powered by a 517bhp 5.5-litre twin-turbo direct-injection V8 mated to a seven-speed automatic gearbox. This is the same engine that's in the S-Class, CL and CLS AMG and offers considerable fuel economy savings over the 6.2-litre V8 that's in the current C63. It's likely to have an optional Performance Package that would boost power to 550bhp at the touch of a button. AMG suspension, braking and steering tweaks, as well as external and interior design changes, will mark the car out from the rest of the C-Class range.